Many coffee lovers prefer to grind whole coffee beans themselves, because they know that doing so results in an impossibly fresh cup. 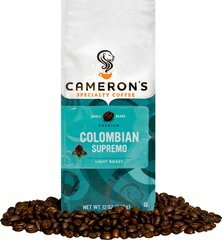 Colombian Supremo uses Colombia's highest-grade specialty coffee beans to bring you a magical cup of coffee brimming with rich flavor. When it comes to premium quality coffee, it’s all about the bean. Our flavorful Arabica beans are precisely blended and meticulously roasted – you’ll taste the freshness in every cup!